With the newly announced $100 billion share repurchase program, it’s clear that Apple is running out of ideas. Orrrrr maybe they’re just being responsible stewards of capital. 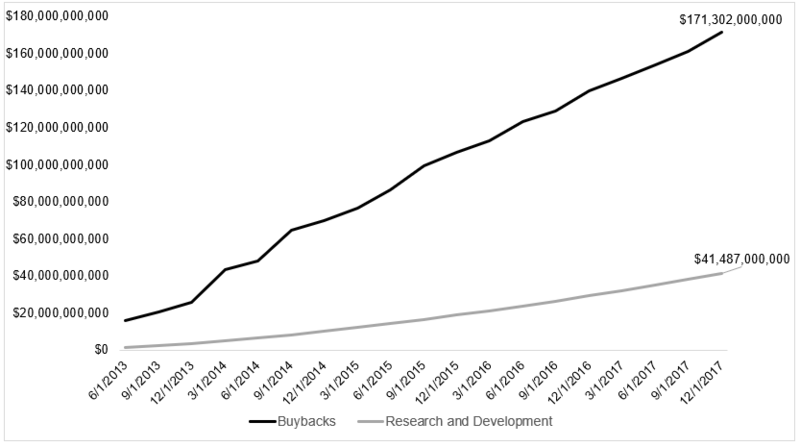 Buybacks have a negative stigma, even though Econompically speaking, they’re actually equivalent. But people hear buybacks and think of Cisco in the 90s and other easily available examples as evidence of their inefficiency. 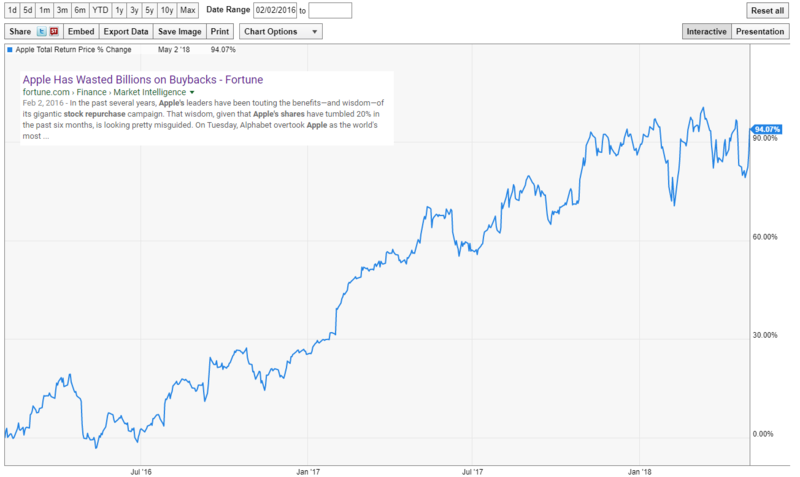 People get worked up over Apple’s buyback program because they think that it’s happening in lieu of other investments. This is not the case, which I’ll get to in a minute, but Jack Vogel has empirically shown that companies that invest heavily in things like R&D make for really lousy investments. Today, however, Apple is trading at around $95. So management paid a 21% premium over the value investors are now according its stock. If Apple were purchasing its shares at current prices, it could buy back 918 million shares, or about one-fifth more. Put another way, Apple’s share buyback, as it turned out, because of what now looks like poor timing, cost it $15 billion more than it had to. These arguments were compelling at the time, but now Apple is now trading at $176, and investors have almost doubled their money since this article came out. Apple has bought back $171 billion over the last nineteen quarters, but they’ve also spent $41.5 billion on R&D! Apple is not buying stock rather than investing in the future, and what to do with all the excess cash is a problem most companies are dying to have. Apple is earning more money than any other company in the world, and they’re being responsible with it. Instead of returning the $100 billion to shareholders, they could buy Qualcomm and Twitter, but for now, they’re staying in their lane.